Introduction: The excessive bone resorption required a treatment by lined with elastic material complete dentures. Their porous structure is a prerequisite for the development of bacterial and fungal colonization. The salivary lactoferrin (LF) and secretoty immunoglobulin A (sIgA) is important for antibacterial effect of saliva and for maintaining of immune status of oral cavity. The purpose of the present in vivo study was to establish the immunomodulatory properties of LF and sIgA in totally edentulous patients, treated with complete dentures, lined with silicone-based elastic materials. Materials and methods: The 43 totally edentulous patients, at the age of 48 – 90 years, were distributed in three experimental groups: C, (n=15) treated with conventional dentures, made only of rigid acrylic resin; A, (n=15) and B, (n=13) treated with dentures lined with heat-polymerized [Molloplast B (Detax, Germany)] and auto-polymerized [Мegabase (Dreve, Germany)] silicone-based elastic materials, respectively. For quantitative determination of LF and sIgA concentration in salvia, before and 3 months after prosthetic treatment, were used commercial kits: Human Lactoferrin ELISA kit and Human IgA ELISA kit, MyBioSource, Inc, San Diego, CA, USA. Results: After prosthetic treatment we established increased salivary level of LF from 0.266 ± 0.006 to 0.282 ± 0.008 µg/ml, p<0.05 in group B patients and decrease of sIgA in group C patients from 165.81 ± 5.50 to 146.91 ± 4.13 µg/ml, p<0.01. The LF and sIgA concentrations did not change in patients of group A. 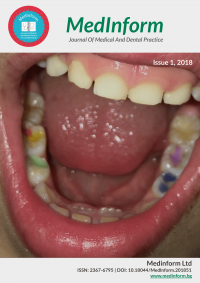 Conclusion: The immunomodulatory role of sIgA or LF has been demonstrated more pronounced in patients treated with acrylic resin complete dentures and those lined with auto-polymerized silicone-based elastic material.